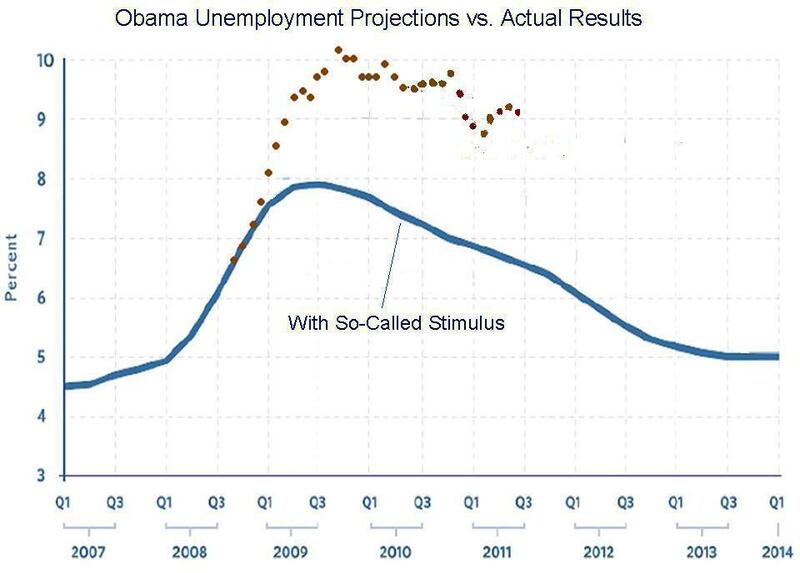 We all know about the wretched failure of Obama’s stimulus, and we can update the chart showing that the joblessness rate is two-and-one-half percentage points higher than the White House claimed it would be at this point if we flushed $800 billion down the Washington rat-hole. 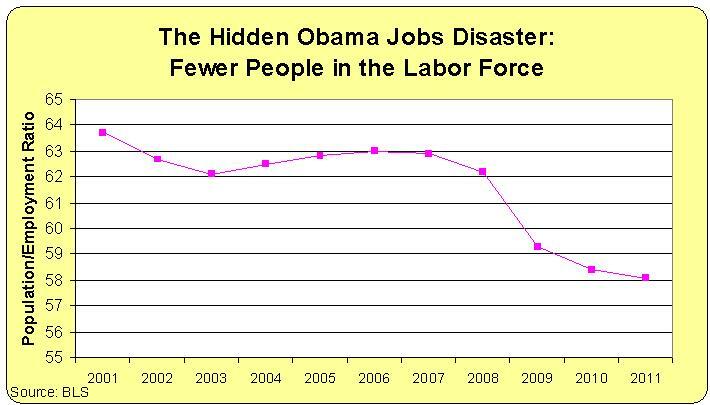 But we also should pay attention to the second Obama jobs disaster. This chart shows the employment-population ratio from the Department of Labor, and it reveals that the number of people participating in the labor force has fallen off a cliff since 2008. The decline began during the big-government Bush years, so Obama does not deserve all the blame. But we can say that his policies have hindered the economy’s natural tendency to bounce back from a downturn. on August 6, 2011 at 9:20 am Art R.
Mr. Mitchell better expand the vertical axis scale on that second graph so that he can continue plotting the line after 2014, when the ObamaCare invitation to indolence program kicks in (yes, the one that says that if you drop your productivity enough to merit a compensation less than $90k per year, then some other American will be tapped to foot almost the entire Health Insurance and Healthcare expenses for you and your family). Sorry I keep posting this, but everyone is too afraid to admit that it is one of the most pernicious measures taken by this administration, something that will set the American work ethic into a vicious spiral of decline and, of course, American prosperity will inevitably follow. Uppercut punch on American productivity for top earners who will be asked to foot the cost, below the belt punch on middle and lower class productivity as people become more insulated from the consequences of mediocrity. That measure alone should have been enough to downgrade the chance that the American people will produce enough to repay in full creditors who lend them money long term ie. loss of AAA bond rating. But I understand. You can’t go to voters, tell them that their hope that somehow some distant unknown others will somehow work for them will not only fail but also destroy both them and American prosperity in the end, and hope to get elected into office. Even Mr. Mitchell would be shut off the main media networks if he dared to explicitly state the obvious. So yes, let’s all admire the emperor’s wonderful parka. I would like to see another chart that objectively plots the intensity of public anger with Washington as measured over time. I’m willing to offer the hypothesis that the rise in anger from 2008 forward would more closely resemble a ‘hockey stick’ curve than the climatological chart with the same description. @phineas, to clarify. When democrats control Congress you blame the Democrats. When GOP control the Congress, you still blame the democrats. How does it work? I wasn’t a fan of Bush’s big domestic spending, but I think it’s stretching a point to say the decline in chart two began in any meaningful way under him. Democrats took control of Congress in January, 2007, about when the decline really seems to start. And, as you point out, recent policies have only made it worse.